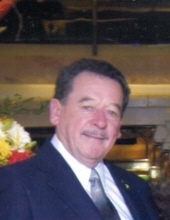 Samuel David Wetzel, age 82, of Union Bridge, died Sunday, March 31, 2019 at Carroll Hospital Dove House after a brief illness. Born March 14, 1937 in Frederick County, he was the son of the late Norman and Virgie Grimes Wetzel. He was the husband of Sandra L. Wetzel, his wife of 56 years. Sam served in the U.S. Army and Army Reserves from 1955-1963. He was employed as a truck driver, first for Mitchell Transport of Union Bridge and then retired from Chemical Leaman of Hagerstown. He was a member of V.F.W. Post #8806 of Union Bridge, Glen W. Eyler American Legion Post of Woodsboro, Littlestown Fraternal Order of Eagles #2226, AMVETS #7 of Thurmont and the Blue Ridge and South Mountain Sportsmen Associations. He enjoyed fishing, hunting and riding his scooter. In addition to his wife he is survived by daughter, Roxanne Magwire and husband Aric of Union Bridge and son, Randy D. Wetzel of Fairfield, PA; 3 grandchildren, Renee Selby, Hailee and Brody Wetzel and a brother, Stephen Wetzel and wife Betty of Hanover, PA. He was predeceased by siblings, Norman L., Leslie M., Lorn, Jerry, and Wilbur Wetzel and Wanda Grimes. A funeral service will be held at 11:00 a.m. Friday, April 5, at Hartzler Funeral Home, 6 E. Broadway, Union Bridge, with Rev. Virgil Cain, pastor of Trinity Evangelical Lutheran Church, Smithsburg, officiating. The family will receive friends at the funeral home on Thursday, April 4 from 2-4 and 6-8 p.m. Private Interment will be in Mountain View Cemetery, Union Bridge, at the convenience of the family. In lieu of flowers, memorial contributions may be made to The Dove House, 292 Stoner Ave., Westminster, MD 21157. To send flowers or a remembrance gift to the family of Samuel David Wetzel, please visit our Tribute Store. "Email Address" would like to share the life celebration of Samuel David Wetzel. Click on the "link" to go to share a favorite memory or leave a condolence message for the family.